Tonight is the last night of the Winter Wonderland Week & I hope you have all had as much fun seeing these cards unfold during the week as I have had making them! It's been a tough at times to get the cards to suit both the challenges I've been entering & to keep within my own set theme, but I think the cards are really striking & I hope the winner thinks so, too! Entries for my competition to win the set of 6 cards (Winter Wonderland Week Days 2 - 7) ends at midnight tonight so quick, quick! Get your entries in!! Click here for more info. The winner will be drawn tomorrow & will be announced here, my FB & by email. For this card, I have used the normal Whisper White card stock base, layered with Basic Black card stock. 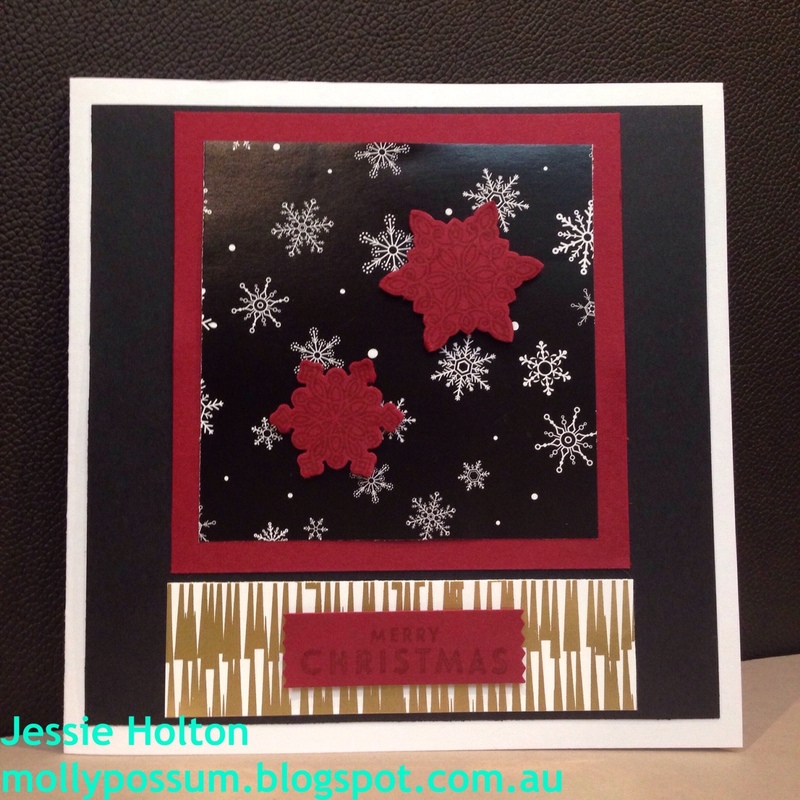 Then I've used the Cherry Cobbler card stock layered with the Winter Wonderland DSP black with white snowflakes & gold trees prints. Both the snowflakes & sentiment have been stamped with the Flurry of Wishes stamp set on Cherry Cobbler card stock & Cherry Cobbler ink. I've used the matching Snowflake Punch for the snowflakes (haha no surprises there) & the Washi Label Punch for the sentiment. I've also stamped the card on the inside using the Cherry Cobbler ink & the "Wishing you a Flurry of Warm Wishes" stamp from the same set. 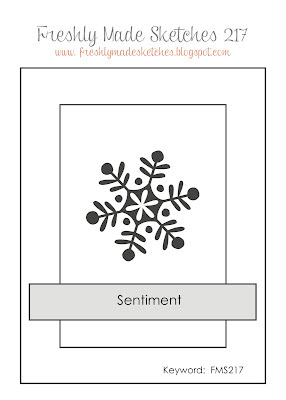 The snowflakes & sentiment are both propped up on Dimensionals. 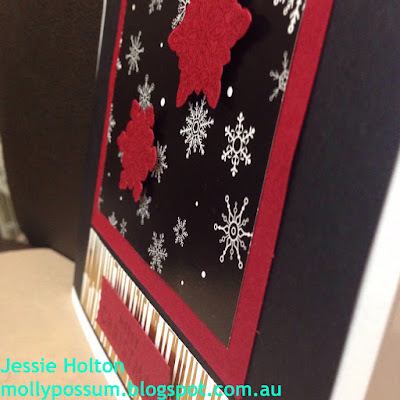 Check back Sunday 6pm AEST for the Crazy Crafters' Blog Hop with the Pootles Gang! Exciting times ahead! The blog hop is a sneak peek for the new catalogue coming out on 5 Jan & there are heaps of really talented people taking part so there are sure to be some really beautiful creations!! Striking colors! 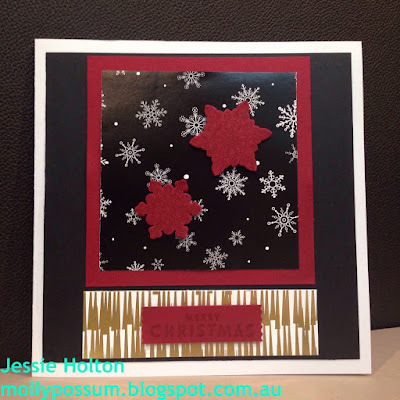 Beautiful card for Christmas! So glad you shared it at FMS! Very pretty card! I really love the black, white, red and gold combination. Happy New Year, and thanks for sharing with us at Freshly Made Sketches!